Andrew Thornton of Green Girl Studios is an amazingly generous soul... He hosts giveaways on his blog every Thursday of the most magical sort. This week it's a massive collection from his recent trip to Bead & Button. 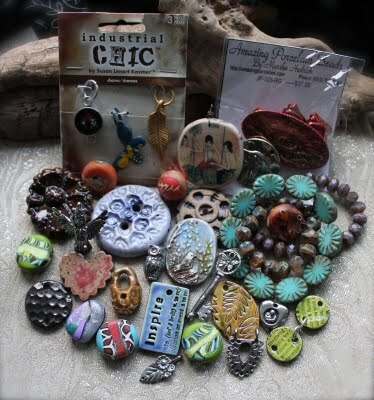 Take a hop over to his blog, follow it, you won't be sorry and enter for a chance to win all of this beady goodness. Hi Sandi Lee, welcome new bloggie, & you know Andrew is an amazing talented soulful man.I have been following his blog for months and his well written post's alway's touch my heart and his Thursday giveaways, more than generous. it's a pleasure to have u as a new follower and i hope we can exchange many post's together! It's Almost Time For My First-Ever Giveaway!! !